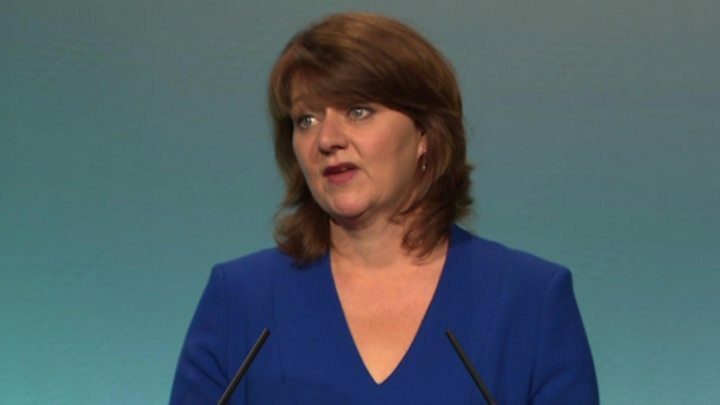 Media captionLeanne Wood said Plaid Cymru had "the ambition to show a new way for Wales"
Leanne Wood has said she needs to earn the trust of non-Plaid Cymru voters as she vowed to stay on as leader. She told Plaid's conference in Caernarfon the party could back another Brexit referendum if there was no deal with other EU states by March 2019. Ms Wood also announced proposals to re-train manual workers whose jobs are threatened by automation. Plaid Cymru won one extra seat in June's general election but saw its share of the vote drop. Ms Wood, leader since 2012, said: "To the citizens of Wales, I want to say that I accept that we need to earn your trust. "You have just voted in the most dramatic election for decades. But Plaid Cymru and I are ready to serve your interests, and has the ideas and ambition to show a new way for Wales." Ms Wood told conference that, if Plaid was in government, it would issue a "rail bond" to finance electrification of the main railway line from London to Swansea "and beyond". "Rather than wring our hands and complain about the Tories, the Party of Wales will respond with a solution," she said. Electrification west of Cardiff has been cancelled by the UK government. Ms Wood promised a "rail revolution", saying a proposed Carmarthen to Aberystwyth route would form a "linchpin in the creation of an all-Wales rail line". 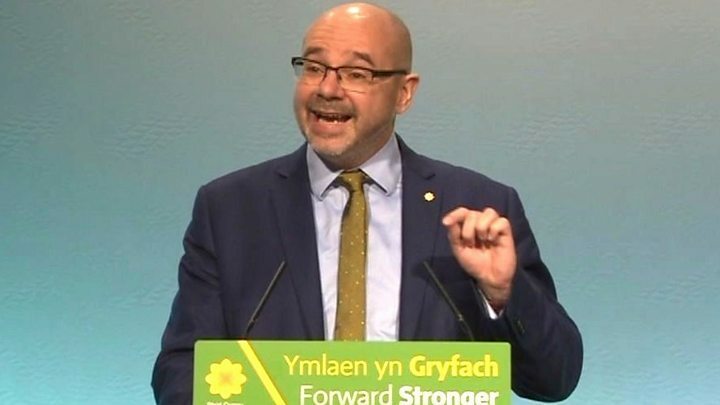 Earlier Plaid AM Simon Thomas told delegates it was the wrong approach to try to "out-Corbyn Corbyn" by positioning itself to the left of Labour, while fellow AM Rhun ap Iorwerth suggested the party was "powerless and under siege" during the general election campaign. But Ms Wood repeated her instance that she would stay on as leader, saying the 2021 Welsh Assembly election would be "an opportunity for political change"
"Friends, Plaid Cymru must lead that change," she said. "And I intend to lead it, as our candidate for First Minister." On Brexit and the prospect of no deal, Ms Wood said: "If, in the worst possible scenario, we leave the European Union without a deal, people must have the opportunity to reject that disastrous outcome, either through a public vote, or through parliamentary democracy." The party would work with trade unions and education providers to offer re-training to 290,000 workers threaten by the increased use of robotic technology in the workplace, she said. Ms Wood's insistence she will lead the party at the next assembly election follows reports of disquiet among some Plaid Cymru AMs. Suspended Plaid Cymru AM Neil McEvoy has dismissed suggestions he was planning a leadership challenge as "nonsense", saying he backed Ms Wood "100%". He was holding a fringe meeting at the conference on Friday, setting out what he described as a "clear vision for Plaid". Typically at conferences, some of the more interesting claims can be made behind closed doors, but here we had senior Plaid politicians giving honest assessments on the podium for all to see. When it came to Leanne Wood's speech, there was some red meat in terms of policy development, particularly on the idea of government bonds for rail spending. But almost more than anything, this was a defence of her record, even drilling down to how Plaid performed in the council elections earlier in the year. This was a leader saying, after five years in the job, there's no one that will be able to do a better job than me at the moment. And this is a question party members in Caernarfon this weekend, and over the next year, will have to ask themselves.